an announcement about his future basketball plans Wednesday. not be taken as a sign that Collison would leave school for the NBA. hire an agent and give up his college eligibility. inherit many of Afflalo's shots, underwent hip surgery last week. leave school. Collison was attending a tutoring session Monday night. I'm betting this is a "will become eligible for draft, won't hire agent" announcement. I would tend to agree he'll probably announce that he's making himself eligible for the NBA without signing an agent. Since Collison is likely to leave for the NBA next season, it might be beneficial to receive feedback from NBA scouts and GMs. Many players are doing it this year, especially a number of college juniors who are using their one chance of being evaluated without harming their amateur status. It makes sense. We'll see what happens on Wednesday. Just read on Bruin Nation Blog that DC is staying! Woohoo! Still have not heard or read a decision from a named source substantiate one way or the other. FINAL FOUR TO WHO KNOWS????????? SportsIllustrated.com - Luke Winn's column stated Alex Legion recently inked with Kentucky. Is this true??? Legion to Kentucky, DC staying in school. DC staying is great news. Afflalo was terrific, but DC was the real MVP. Imagine Kevin Love's outlet passes going to DC to ignite fast breaks. Nest season will be fun. Yes, according to this article Legion has signed a 'scholarship' not an NLI with Kentucky. But bottom-line he's going to the Wildcats. Unlike a national letter of intent, Legion’s signing will not be binding. Under NCAA rules, a recruit can’t sign two letters of intent in a recruiting year. Legion signed a letter with Michigan last fall. He was released from that letter after then coach Tommy Amaker was fired. As for the two available scholarships, with Legion gone, not sure if the Bruins will have the opportunity to sign another 2007 recruit. There are a couple of blue-chippers still available such as Patterson and Jai Lucas, but the Bruins are not currently in the running for them. Many expected UCLA to be busy with the recruiting 2009 class, but with two scholarships available this year plus Mata's and potentially Collison and Mbah a Moute next, Howland is expected to add at least two more, if not three, from the 2008 class. 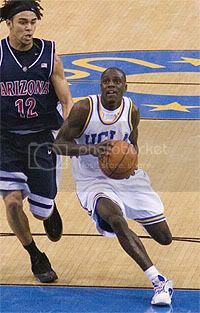 Obviously Jrue Holiday has been a major target for UCLA, but as many have figured, a post man is a necessity. With Drew Gordon, the post from Mitty already offered, don't be surprised to hear more offers this summer to other 2008 big men.